... 1972 (40 years ago today), a "furious crowd" of as many as 30,000 persons destroyed the British embassy in Dublin, Ireland. According to the BBC, the crowd "had been besieging the embassy building, in Merrion Square near the parliament building, for almost three days"; that is, since January 30, 1972, when British paratroopers opened fire on unarmed civil rights protesters in Derry, N. Ireland. Thirteen boys and men died instantly; a 14th would later die from his wounds. 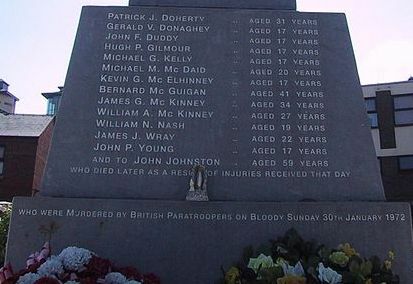 (credit for photo of base of Derry monument to those killed) As IntLawGrrls have posted here, here and here, it would take until 2010 before a British Prime Minister made a full apology for the incident, known as Bloody Sunday.